Our pipeline services include pre-commissioning, commissioning, regular maintenance and shutdown services. We acknowledged the perilous nature of these services and have included an unparalleled project execution capability within each scope. We offer a proactive approach towards chemical cleaning. When compared to mechanical cleaning methods, our chemical cleaning process reduces downtime, reduce exposure to toxic materials and environmental hazards. The objective of chemical cleaning is to remove unwanted foreign material inside the pipeline or system. Key concerns are to remove weld scale, grease & oil, mill scale, corrosion products, sand, dirt, temporary protective coatings and other undesirable debris. To conduct a proper chemical cleaning method, several factors are considered. We identify the key process equipment and solvents required for the cleaning process based on the type of pipeline or system material being used. Subsequently, we generate the project work scope required to conduct the task with a cost analysis benefit and execution plan. Upon job completion, all solvents are carefully disposed without causing any harm to the environment. Our oil flushing service for hydraulic and lube oil pipeline systems ensures that the equipment will start up and operate as designed and significantly reduces the potential for premature failure. 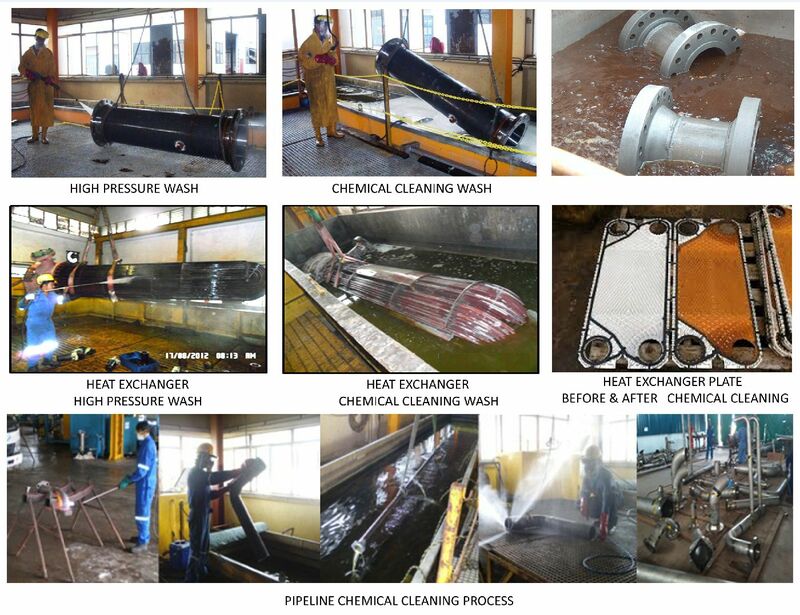 The objective is to remove contaminants such as water, rust, loose scale, weld slag and dirt from the system with preoperational cleaning method first before processing with oil flushing procedure. Any facility that has a low tolerance for equipment failure will find this service key to their preventive maintenance program. 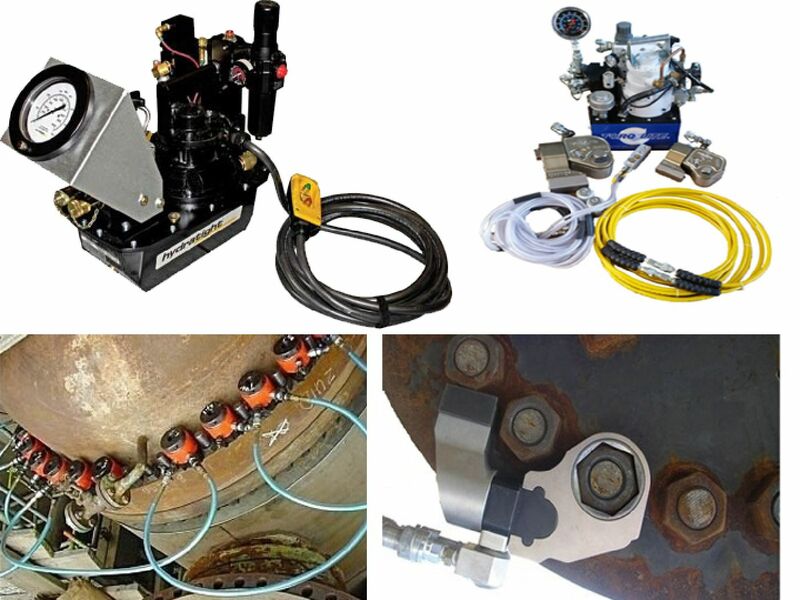 We understand that estimated 80% hydraulic system failures are due to improper or poor fluid condition, thus our aim is to provide cost effective oil flushing solutions to all our customers. 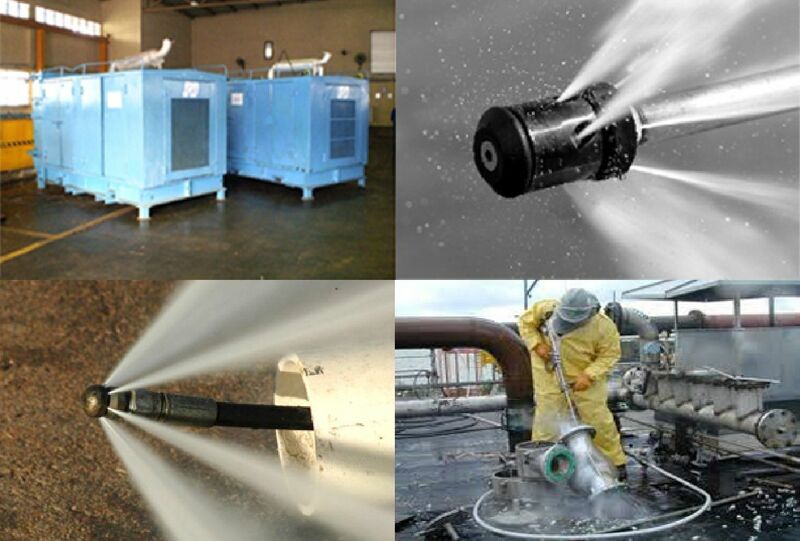 We provide hydro jetting services which are also known as high pressure water jetting service. The process uses highly pressurized water from 3,000psi to 40,000psi to clean and remove any unwanted construction debris, rust, mill-scale from newly installed pipeline and even cold cut materials in any open or enclosed areas that are difficult to access. At 4,000psi, hydro jetting systems has the power to burst open the toughest blockages and at the same time scours the full diameter of the pipe, flushing debris, leaving a clear surface. 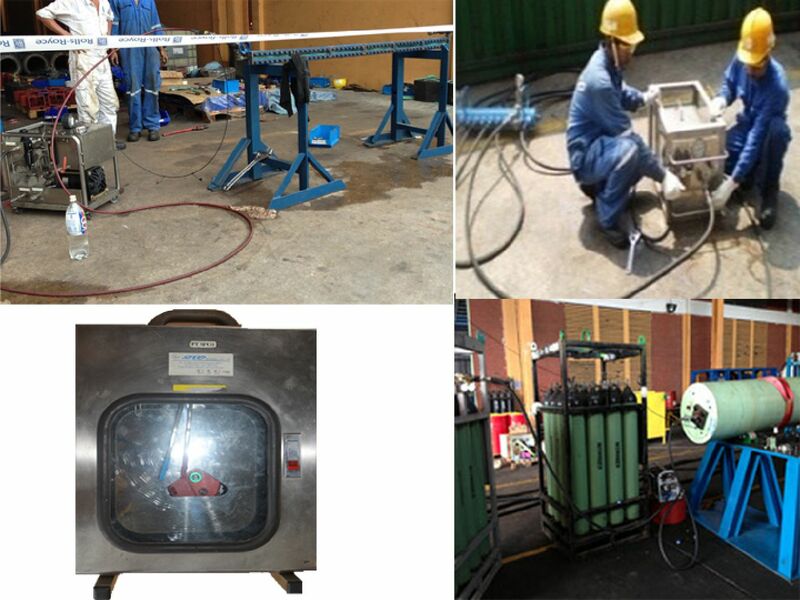 Extremely high pressure systems with 40,000psi and above are used for concrete cutting. Generally most hardened deposits respond better to higher pressures, and softer buildup are best removed with higher flows. These techniques have been used in practically every industry especially in cleaning of internal and external walls of pipelines, heat exchanger, boiler tubes, air fin coolers, tank, vessel, drainage etc. Hydro jetting cuts away clogs and slugs to prepare surface materials for repainting and removes grease build-up, rust, rubber, chemicals or other heavy build up without causing damage to the surface below it. One of the major advantages for hydro jetting over other cleaning abrasives (such as silica sand, coal or smelter slag, metallic, synthetic, organic nut shells or fruit kernels) is its ability to contain, capture, filter and reuse the water. This eliminates waste water and contaminants after the cleaning. Our service includes provision of hydro jetting systems, hoses, standard or rotating nozzles and specialists to perform the cleaning. 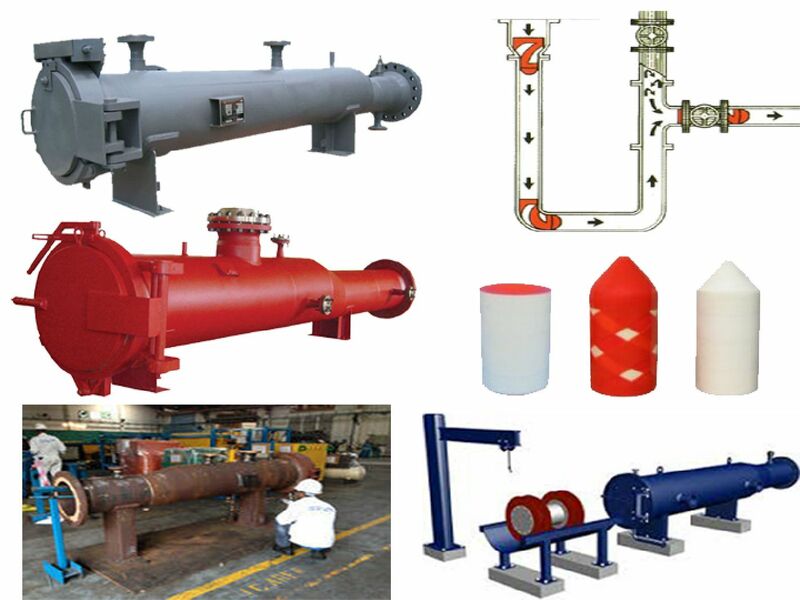 Properly sized high pressure system will be matched according to various project requirements. Pressure testing ensures that pipelines or vessels are leakage free and complies with international safety standards or as per defined specifications. The test involves filling the system with air, nitrogen, water, glycol or hydraulic oil, which is then pressurized to a specified pressure and hold for a period of duration depending on its standards or specification. System strength is also tested by measuring permanent deformation through hydrostatic test. The procedures are documented in the operation manual and equipment certificates are included. Such pressure tests are conducted by our skilled engineers and technicians who are highly trained not just in the practical operation but also in the technical theory behind the operation procedure. The combined practical and theoretical understanding coupled with our extensive experience contributes to an effective, efficient and safe process. With the ever increasing demands of aging processing plants, the handling of highly flammable fluids and toxic gas at high pressures requires the need for stringent safety standards. To comply with these standards, all leaks need to be located and remedial actions to be taken. In order to detect even the smallest leaks, the most effective method is to use helium as a traceable gas as it is mono-atomic. The fact that it is totally inert makes helium ideal for leak detection purposes. 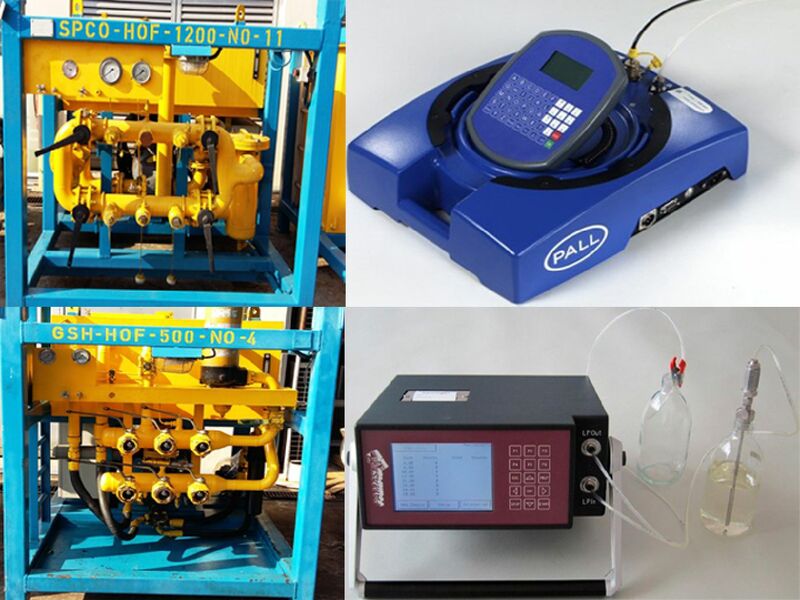 Its use for this application is widespread and there are a number of different instruments capable of detecting small concentrations of helium gas. The most sensitive instrument is the mass spectrometer, which combines a high sensitivity with precision selectivity and is therefore not affected by the presence of other gas and contaminants. As the use of pure helium for leak detection purposes would lead to a huge consumption of this rather expensive gas, a mixture of 1% helium and 99% nitrogen is usually used to enable a reliable detection of leaks down to 0.05 Nm3/year. The entire operation is carefully planned and carried out in a safe and efficient manner. In preparation for the test, the flange connections are taped in order to encapsulate the space between the flanges, thus capturing any escaping gas resulting from a leak in the encapsulated space. The nitrogen/helium mixture is injected into the system or installation until the required working pressure is achieved. The test probe, which is connected to the Mass Spectrometer via a small bore vacuum hose, is inserted through the tape. Any gas present in the encapsulated space are transported to the Mass Spectrometer and analyzed for traces of helium. 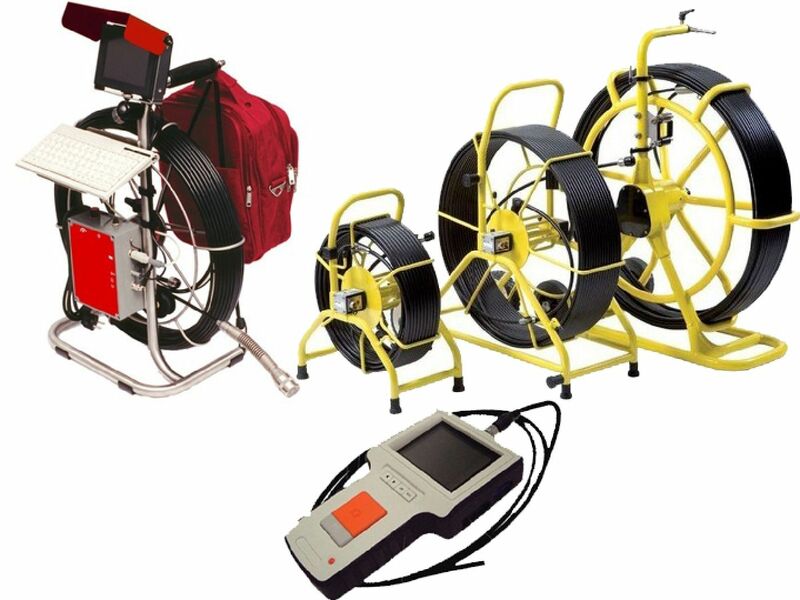 If helium traces are detected, an accurate equivalent leak rate is determined so as to assess any remedial actions to be taken. The results of the test are tabulated and issued in a report, identifying number of leaks detected, location and leak rate per year. Dewatering process is the removal of test water from the pipeline before proceeding to drying procedure. Due to preservation of water and limited water sources, we are capable of quickly and safely extracting and recycling the test water from the tested pipeline to the next pipe spool section. After dewatering process, a thin film of water will be clinging to the inside wall surface of the pipe. Upon job completion, used test water will be carefully disposed. Drying of pipeline is mandatory especially for oil field, gas and petro chemical industries. The objective is to remove residual water and water vapor to eliminate the formation of hydrates and possibility of internal corrosion. Moisture level will be monitored by a dew point meter. Drying process can be conducted using hot air or nitrogen depending on system requirements. Using nitrogen gas for drying offers a number of advantages for drying operations. Nitrogen gas has dew point between -62°C and -67°C and provides an inert dry atmosphere. This process reduces oxidation and no purge is required after drying is complete. SPCO has the expertise and equipment to ensure that your requirement will meet or exceed the drying specifications using the least amount of time and at the lowest possible cost. Our flange management and controlled bolting services are recognized to be cost effective and efficient in ensuring a leak free system. 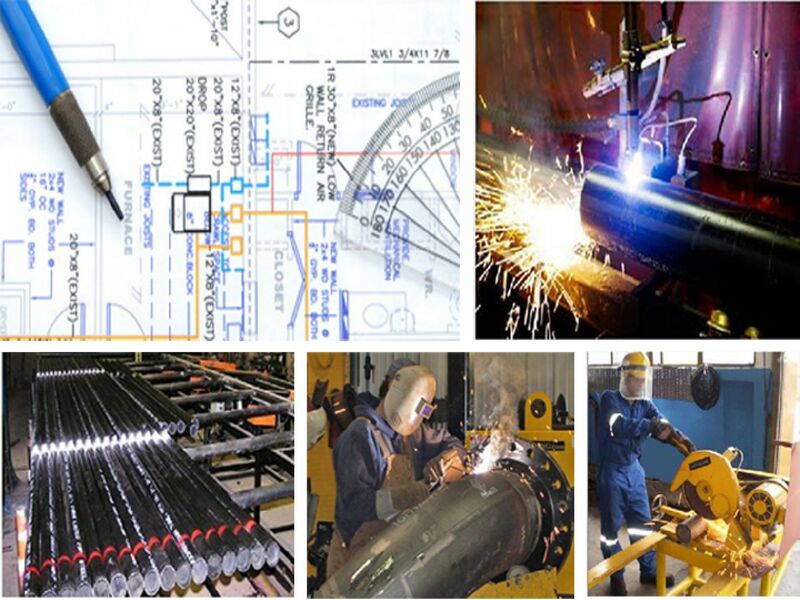 Specialized bolting equipment used for bolt tensioning and torqueing ensure the correct controlled bolt load are achieved for all bolted joints during construction and for all subsequent maintenance & repair operations. We offer a complete one-stop solution for flange management joint integrity service and a customize solution to ensure efficient use of resources from simple flange joint project to full plant construction project. Video inspection provides a real-time visual inspection for the pipelines system to determine the internal condition. A flexible fiber optic cable with a specially designed high-resolution video camera on its tip is inserted and pushes or pulls into the system. In this process, the hardened waterproof camera equipped with powerful lights, records its journey and findings. Video images are transmitted to an external monitor for the operator to identify any damages, obstruction that inhibit proper flow and create occasional repeated buildup. The video images can be saved for a permanent record. The internal condition of a system typically cannot be determined without a visual inspection using an in-line camera. Pipeline pigging is an effective way to remove loose debris, water and unwanted contamination buildup of internal pipeline. Using this method, even pipelines several kilometers long can be made spotlessly clean and clear within one day. Form pigs are molded from polyurethane foam with various configurations of solid polyurethane strips and/or abrasive materials permanently bonded and usage depend on the nature of pipeline requirements. It comes in low, medium and high density with varying size and some with built-in tracing device in case the pig is lost half way down the pipeline. There is also gel pigs used as a carrier of corrosion inhibitor in gas pipelines. A form pig is positioned inside a pig launcher compressed with air waiting to be release. Upon releasing the compressed air, the form pig runs through the pipeline and lands on the other side where the pig receiver will capture and stop the fast travelling form pig from propelling further. In case of heavy build-ups, the form pigs are introduced into the system in a progressive manner beginning with smaller and softer cleaning units working up to full sized cleaners with more abrasive materials.